Your garage is a great choice for a new living space conversion in your home. Children coming home from college have been living above their parents’ garage for years, and as older family members live longer, they’re also moving closer to family. However, these garage apartments aren't limited to family. If you convert your garage to an apartment, you can also rent it out to tenants for extra income. Any home renovation starts with a good plan. Because there are often unexpected obstacles in a home renovation project, a solid plan will help you to stay focused and complete your project as close to your timeline as possible. This includes any budgeting and permits that you may need to convert your garage into an apartment. However, the most important aspect of your garage conversion is what you plan to use it for. Many people have decided to join the recent trend of tiny homes and convert their garages into fully functioning homes. This garage conversion is popular among those who are looking to save money and live more simply. Your garage apartment can be kept to a single floor, or you can incorporate a loft bedroom design. Some homeowners decide to live in their new tiny house while renting out their larger more traditional home. If you want to continue to live in your main house, but want the extra income of renting out your property, turning a garage into an apartment may be your answer. The beauty of being a landlord on your own property is the close proximity between the two living spaces. You can easily convert your garage into a studio apartment by keeping it to one level. If you want the apartment, but don’t want to lose your car’s parking spot, you can create a garage loft. You can use an exterior entrance to keep the two spaces completely separate. Home renovation costs are always going to vary based on the home and the design ideas. An approximate price for a full garage conversion is $20,000. This includes any material and labor costs you may acquire during the conversion process. A DIY conversion can be as low as $7,000. However, many people want a high end renovation especially if they plan to rent it out. While the initial cost may seem high, you will see a larger return on investment for a more expensive conversion. If you plan to renovate any part of your home, you will need to find out if you need building permits. While there are some exceptions to these laws, a garage conversion will definitely need permits. You are creating a new living space that will require the altering of walls and rewiring of electric panels. Both of these things require permission from your local municipality. While it may seem like you are doing internal work, and it therefore doesn’t matter, you can face major fines for not acquiring the proper permits. The best way to find out what you need is to call your local municipality. Building code is of equal importance. Building code is a collection of safety standards that all buildings should meet. If you plan to rent out your new apartment to tenants, you will be required to meet building code. Your space cannot pass inspection without meeting these safety requirements. Even if you’re not planning to rent out your garage, you will want to meet building code if you ever plan on selling your home. Keep your garage conversion quick and easy with Salter’s prefab stairs. We offer a high quality staircase solution shipped straight to your door ready for installation and use. There are several steps and considerations that go into converting a garage into an apartment. When you look at the original purpose of the building, it was a storage unit for your car. However, you’re not creating a living space and that requires some major construction. Your garage starts as a blank canvas, and you’re rebuilding the interior structure to create the space that you want to live in. This includes everything from basic construction elements to utilities. Garage floors are typically concrete slabs that are poured, sealed, and left to age and weather over time. If you want to keep the industrial style of a garage conversion, you can strip and stain your concrete floor. There are two different kinds of concrete stain: acid based and water based. Acid based concrete stains react with the concrete to create unique patterns in earth tones. Water based concrete stains are more similar to a paint and create a uniform opaque color across your floor. You can use a sealant on your concrete after staining it to create a marble like finish. Tiling is another common option for garage renovations as they are easy to install on the existing concrete floor. Homeowners use both ceramic and vinyl tiling depending upon budget and the design style that want. The two flooring options that require a little extra work are wood flooring and carpet. Both of these options require a subfloor be installed on top of the concrete. This will raise your floor which will need to be accommodated in the entryways. While they are more complicated to install, they are the most traditional flooring options. There are a few different decisions that must be made with the walls while you’re converting your garage into an apartment. The first project to tackle is to evaluate the current walls and see where they need to be renovated. Normally these walls are sturdy and don’t need too much work. They normally just need an addition of new drywall. If you plan to use the garage as a studio apartment, you only need to add the interior walls for the bathroom. However, if you want to separate all of your living spaces, you will need to build many more interior walls. For this reason, many leave their garage apartments with open floor plans. Windows can transform your garage from a small dark room to a beautiful open apartment. Windows allow natural light to fill your space, which makes it look much bigger. It’s not common for garages to have a lot of windows. This means that some extra construction will be necessary to install the windows. Skylights are a popular option for those that may not want to alter any of the exterior walls, but want the benefits of natural light. The most iconic part of a garage is the door. Whether you manually pull up the door or use an electric door opener, the wide door is a defining feature of the structure. You have a few options when looking to renovate your garage door. The first is to leave the door the way it is. You wouldn’t use it as the main entrance and exit points, as it it’s huge for a residential door. However, it can be used as an interesting architectural element. This is also a great option for those who have to go through a Homeowner’s Association. Most HOAs require that you leave the exterior of the building intact, meaning that it still looks like a classic garage from the outside. You can add a second door that the resident would use on a daily basis. If you want a more modern look, you can replace the garage door with all glass. If you’re living in an area that has mild to nice weather all year round, this can help you to enjoy the outdoors. The glass can be giant windows, sliding doors, or a combination of the two. This allows the maximum amount of natural light into your home. If you want to close off the space a little more, you can add curtains to the inside of the glass doors. Many tiny homes choose to utilize loft bedrooms and garage conversions are no different. If you want to really maximize your space, use a tiny house stair option to access the upstairs room. Ladders are always one of the most popular options to access a loft in a small space. It has virtually no footprint and can easily be moved around your space. However, it might not be the best option for those looking to rent their space or garage apartments for elderly family members. They aren’t stable and don’t have the benefits of a full step. When looking at those drawbacks, your natural thought may be to look at a traditional staircase. It’s definitely stable and has full steps. Traditional stairs have a large footprint that may not fit into your garage apartment. Spiral stairs are a happy medium between the two. Spiral stairs are a popular options for garage conversions because of their small footprint. There are plenty of customizable options on both indoor and outdoor spiral stairs to meet your design ideas. The full steps are perfect for those looking to rent out their garage. One of the most common problems that homeowners run into when converting a garage is temperature control. If you’re renovating the garage from top to bottom, you can add extra insulation to the ceiling and exterior walls. This will help keep the warm air in the building once it’s there. However, you need to get the warm air into the commonly cold apartment first. If your garage is attached, you can easily have it on the same heating and cooling system as the main house. This is the most economical solution. However, detached garages are becoming more common in newer home designs. In this case, you can choose to utilize space heaters and window air conditioning units for the most economical solution. The basic utilities are probably the most expensive part of your garage renovation. If your garage is attached to the main house, the cost won’t be as painful as the existing wires and pipes can be rerouted to the new apartment. A detached garage will be more complicated. You will have to run the pipes underground from the main house to the smaller building. You can expect the average price to be about $3,000 each for electric and plumbing. Many homeowners have become ambitious over the years and have started to make their home renovations DIY projects. This is easy for simple projects, like painting a room or refinishing a table. However, a full garage conversion can quickly become complicated. If you’re turning your garage into an apartment to rent, you will need to meet building code and it will have to pass inspection. The best way to renovate your garage to ensure passing inspection is to hire a contractor. Not only will you know that your building meets code, but the craftsmanship will most likely hold up better over time. Many garages utilize a studio floor plan with the only separate room being the bathroom. This is due to the space constraints that usually come with a garage conversion. By eliminating walls, you’re able to use as much space as possible. Open floor plans help the apartment to feel larger and more spacious. If you want a separate bedroom area, consider a loft. Bedroom lofts are popular in tiny homes and urban apartments. They create a room by separating the space from the other common living space. Homeowners want a plan to enjoy the outdoors during nice weather. For many this means a backyard deck. However, a deck is too big for a garage apartment. The perfect solution is a balcony! A balcony can be described as a deck’s younger sibling. It has the same idea of an elevated space outdoors, but on a smaller scale. Just like decks, balcony designs are unique to the home! Garage apartments commonly share design styles with their more urban counterparts. 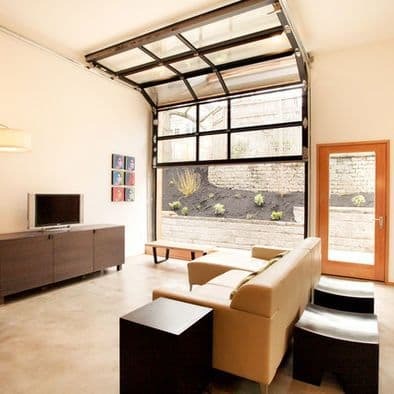 Both studio apartments and garage conversions usually have industrial and minimalist design aspects. You don’t want to crowd an already small space with lots of furniture. Minimalism features clean lines with basic furniture frames. This keeps your apartment open and light. Industrial design uses features of the building itself to support and industrial furniture that uses both wood and metal. This plays on the repurposed aspect of your space. Garages are the perfect place to incorporate a new living space in your home. The previously open structure is typically used for extra storage or is simply left open for your car. However, with the right design, your garage can become a unique and beautiful apartment. Whether you decide to use it as an extra form of income or as an in-law's suite, the apartment will be an added value to your home!